2. Spread the hazelnuts on a baking tray and toast in the oven for 10 minutes. Remove and allow to cool for 5 minutes. Place the nuts in a clean tea towel and firmly rub together to remove their bitter skins. Discard what you can of the skins, then crush the nuts using a pestle and mortar or the end of a rolling pin in a bowl. 4. Place the flour, butter and brown sugar in a large bowl and, using your hands, lightly pass the mixture through your fingers, working the ingredients together until a crumb mixture forms. Add the hazelnuts, oats, ginger and salt and continue to work with your fingers until combined. 5. Pour the crumble mixture onto a baking tray and bake in the oven for 10 minutes, giving the crumble a little stir after 5 minutes. Remove from the oven, sprinkle the crumble over the fruit, then return to the oven for 25 minutes until the crumble is golden brown. Allow to rest for at least 10 minutes. 7. 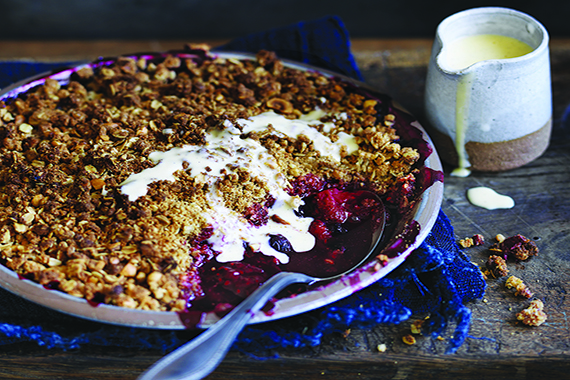 Present the crumble with the custard in a jug on the side.